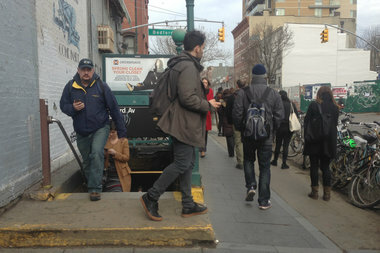 L train commuters exit the Bedford Avenue station after a broken rail stalled trains at Bedford Street Monday. BROOKLYN — L train service into Manhattan was suspended for more than three hours Monday morning due to broken rail at the Bedford Avenue station, according to the MTA. All Eighth Avenue-bound L trains were making their final stops at Bedford Avenue during rush hour Monday morning. Commuters headed to Manhattan had to take the B39 Bus across the Williamsburg Bridge as an alternative, the transit agency said. L trains in Manhattan still ran between First and Eighth avenues during the suspension, and Canarsie-bound service was running with delays, the MTA said. The train started running again around noon with residual delays, according to an MTA spokeswoman. A train operater reported an unusual noise around 8:40 a.m. at the height of the morning rush, a spokeswoman for the MTA said. Service was halted soon after so a team of workers could inspect the tracks. The team determined the rail was broken at roughly 9:15 a.m.
Around 10 a.m., an MTA employee told commuters that a shuttle would be running from the Bedford Avenue station to the Marcy JMZ stop, though it was unclear when it would start. Some commuters said they spent close to an hour underground Monday morning, with no word that the train had stopped running past Bedford Avenue. "This is the worst," said Chayenne Mia, 21, who spent 30 minutes underground after entering the L at the Montrose stop. The train stopped about 10 minutes at every stop, she said, leaving her an hour late in getting to work in Midtown. Many people who exited the train at Bedford Avenue pulled up their phones in hopes of nabbing an Uber or Lyft into the city. Several cars with Uber signs stopped at Driggs Avenue at North Seventh Street to pick locals up, but not everybody was lucky enough to grab a car. New School student Catharine Wolk, 22, spent 30 minutes underground after entering at the Grand Street station and found that no UberX cabs were available when she got out at Bedford. "I might go back home and give up," said Wolk, who said the suspension would make her miss her econometrics class completely. Occy Cleveland, 28, decided to forgo Uber after seeing that surge pricing had reached 2.3 times the regular rate, he said. After spending 45 minutes underground after entering at the Graham Avenue station, he was already an hour late to his job in the West Village. "I'm frustrated," said Cleveland, who opted to walk to the Marcy Avenue JMZ station. "But you learn to live with this kind of thing." Monday's commuter headache is one of many that L train riders have suffered through recently. The L train suddenly stopped service between Lorimer Street and Myrtle-Wyckoff Avenue several weeks ago during the evening commute. Beyond unexpected delays, the L train is planning for a host of service disruptions in the coming weeks, including weeknight suspensions and a six-week weekend suspension. Michael Connelly, 30, said he deals with delays almost weekly and was missing a doctor's appointment because of Monday's stoppage. "It's kind of the worst way to start the week," he said.